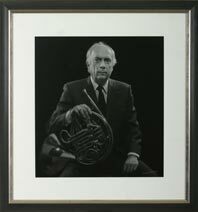 Verne Reynolds (1926-2011), professor emeritus of horn, began teaching at Eastman in 1959. He received his bachelor’s degree in music from the Cincinnati Conservatory of Music in 1950, and his master’s degree from the University of Wisconsin in 1951. He also received a Fulbright grant for study at the Royal College of Music in London, England (1953-1954). He performed with the Cincinnati Symphony Orchestra and the American Woodwind Quintet, and served as principal horn of the Rochester Philharmonic Orchestra from 1959-1968. Before coming to Eastman, he taught at the Cincinnati Conservatory (1949-1950), the University of Wisconsin (1950-1953), and Indiana University (1954-1959). Mr. Reynolds was a founding member of the Eastman Brass, and toured and recorded extensively with the group. In 1983, the members of the quintet received the Kilbourn Professorship, in recognition of their work in elevating the brass quintet genre and expanding its repertoire. A respected composer, Mr. Reynolds received awards and commissions from many orchestras, solo performers, universities, and chamber groups, including the Eastman Brass, the Cincinnati Symphony, and Doc Severinsen. Mr. Reynolds published numerous original works and is particularly well known for his transcriptions of Renaissance and Baroque music for brass quintet and horn choir.